Hi! Followed the tutorial, and everything is working fine. 1- When trying to run command `lsmod | grep -i 'vga_switcheroo'`, this doesn't return anything. 2- When trying to run command `optirun -vv glxgears` I had errors like some that were posted here before (GPU driver not found, etc), and I fixed it with this `You must edit /etc/bumblebee/bumblebee.conf using your preferred editor as root, and change "KernelDriver=nvidia" to "KernelDriver=nvidia-current", then restart the bumblebee daemon, i.e. sudo service bumblebeed restart `, found in this https://wiki.debian.org/Bumblebee#Reporting_bugs.2Fproblems page. 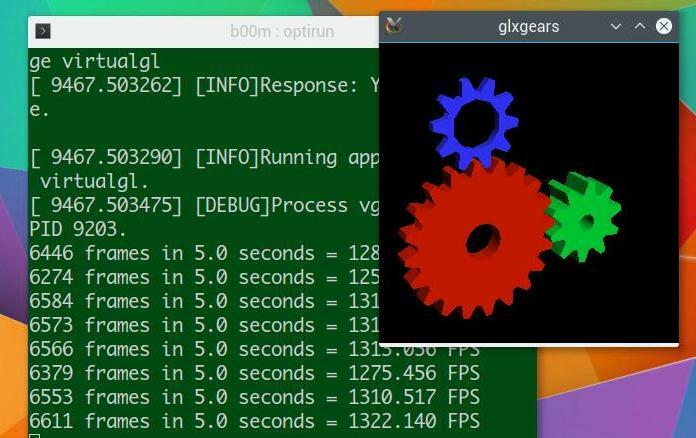 3- When running satisfactory the command `optirun -vv glxgears`, this shows me an average of 770 FPS. Is this normal? I have a Nvidia 940MX, maybe is a little lower due to it's age, right? Anyway, good tutorial, and cheers! Yes this solution is works, but how to turn nvidia drivers to all X.org? Glxgears show good value FPS but i need to use HDMI to connect monitor. That could be achieved with Synergy, try these links. Hello, why Im getting this error when I try check optirun ? I can check after run command "service bumblebee restart". But after reboot laptop I have to run that command again. What I'm doing wrong ? [ 49.452866] [ERROR]The Bumblebee daemon has not been started yet or the socket path /var/run/bumblebee.socket was incorrect. [ 49.452882] [ERROR]Could not connect to bumblebee daemon - is it running? Thank you, this guide works perfectly on Sparky rolling (Debian testing)! Unfortunately I'm not, would be helpful if you point out. modprobe: FATAL: Module nouveau is in use. You need to prevent loading nouveau during boot. There's many way, one of them here. I have an Asus EeePC 1215N that uses the Nvidia GT218 Ion GPU with Optimus. I have no problem until I get to the driver install when it attempts to install version 384.130-1 which doesn't support my card. According to the Debian site I need to install version 340.107-2 however downloading and installing the .deb package I get an error: "Dependency is not satisfiable". I've also downloaded all the packages which it says are required but no matter which sequence I try to install them I get the same error. I'm running MX 17.1 64bit which has an Nvidia driver installer but it too tries to install a later version driver that doesn't support my card. The website field shows the source of my information. At present I'm using the nouveau driver and wouldn't mind being able to switch back and forth with the Intel GPU. I don't know if I go and install Bumblebee from the repository whether or not that would help me. What do you think? then you could unpack the deb file with dpkg-deb --raw-extract and edit the DEBIAN/control file to remove the dependencies. Then repack and install it. Well, this is not very clear, but I hope you've got the idea. Thanks Very Much! Works fine on MSI GT70-2PC nvidia 870m, around 3000 FPS. Thank you Arnab, after about 3 days of trying different guides and learning more about Optimus laptops, I stumbled across your guide. I have a MSI GS63VR with an nvidia 1060 in it. This guide worked great with Kali 2018! And now I can still use the nvidia card for hash cracking when I need it. Thanks again. Hi, I follow your howto on my Asus UX303UB, thanks for your help. Have I to use 'optirun vlc': this command works, but I don't know if it's the same? Or have I to do something different? I don't think VLC can use nvidia optimus cards to decode videos with VDPAU. At least it never worked for me. Thank you a lot man, if I ever see you in life I'll buy you a drink! Is it still safe to proceed? I think it's absolutely safe as long as you can fix what you've broken. I truly appreciste you taking the time to write this guide! However, I couldn't even get past installing the appropriate packages. It refuses to install nvidia-kernel-dkms , amongst the others, and states that a ton of libglxxxxx packages break , or conflict, with what were trying to install. Guess wete forever stuck with poor battery life and no dedicated gpu! First, this tutorial is not updated over a year. Second, NVIDIA 1050M is too new hardware, probably it's optimus capability not tested by many, even the Debian package maintainers. [ 497.322197] [ERROR]Aborting because fallback start is disabled. [ 497.322203] [DEBUG]Killing all remaining processes. Even after configuraung everything properly, still it may not work due to Kernel version and NVIDIA driver version incompatibility. It's hard to tell which one is causing the incompatibility. The only viable way to solve this is through trial and error, upgrade the kernel and the driver, that might help. I am not getting 1000FPS as You said. I said over 1000 FPS.